Give into plush textures with this gorgeous oversized teddy bear coat. Perfect to take you from day to night, this coat features a high neckline with long sleeves, cosy side pockets and fastened with hook and eye. Luxurious coat in unusual colour which has received many comments! Had to turn sleeves up to for a cuff but no a problem for me. I got this coat to go with my little black dress but wanted to add a bit of colour! It is a beautiful quality coat and looks stunning! 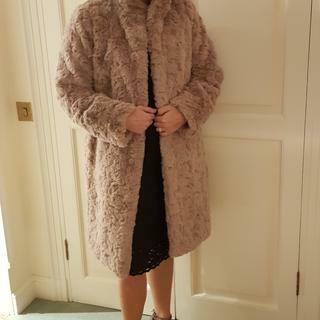 Love this coat sooooo soft, bought a size 14 & it is perfect I am 5’4 & the coat is knee length. I would be happy to recommend this lovely cosy coat. It is a gorgeous colour (I bought the pink one) and a good heavy weight. The length of the coat and the sleeves suit are perfect. Can't wait to wear it to my Xmas night out! What a lovely coat! So soft and a lovely pink colour. This coat is quite heavy and is so warm. Looks great over a dress and also really good with jeans. Would definitely recommend it. Lovely coat. Luxurious feel to it and very warm. The hooks are secure but a bit fiddly. Love this coat. Looks amazing whatever I'm wearing. Beautiful coat. Very warm and stylish. Ideal for cold evening out. Great quality and feels fabulous. Lovely quality with a luxurious feel very happy with the fit and the length. Beautiful colour too. So glad I eventually bought it after hesitating for some time. Lovely luxurious coat, quality very good and price very affordable! Would certainly recommend to others. Very pleased with service! I absolutely love my coat feel a million dollars in it . Gorgeous coat and the quality is fab. Would definitely recommend. Well worth the money. Looks smart and very cosy. Only downside, is the hooks seem to be on the wrong way, difficult to do up. Colour is lovely. Absolutely beautiful coat, the photo doesn't do it justice. The fit is perfect and the quality is stunning, I can't recommend this highly enough. Well done Roman you've done it again superb quality for reasonable prices. Love it ?? Great, love it! It's so warm and soft. I felt very elegant in it and I would definitely get the grey one too. Love love love it. Heavy and warm for the money I don't think there's a better faux fur coat. Had so many compliments from strangers I feel fab when I'm wearing! Lovely warm coat, the colour is almost like a lilac pink which I like as it's not too bright. The sleeves were a bit long for me, so I just turned the cuffs back and it looks part of the coat, the length is on my knee as I am a size 12 and 5ft 2. Great quality and looks fabulous. The colour is so nice too. It's quite heavy, and therefore does keep all the cold and wind out. Very soft and comforting to the touch, and very stylish. Love it! Very soft faux fur, just the right tone of pink. Can’t wait to wear it. I love my faux fur coat. It's a great length. It's so warm. The most amazing thing about it in my opinion is the colour. I chose the pink. It's totally gorgeous. Should be just the job for our trip to Boston next week. If you are considering buying this coat go on treat yourself. You won't regret it. This is a lovely, thick, heavy coat which fits true to size. It is really glamourous and a lovely shade of dusky pink. Great value for money too! Absolutely love this coat! May even get the blue one too!! Well done Roman! Great value for money, good fit, lovely colour and style. Gorgeous coat. Luxurious material. Very classy. Would certainly recommend to friends. Perfect fit. Absolutely love this coat. So warm and soft and very fashionable. The colour is gorgeous. Quite simply fabulous .. great fit and shape really pleased with this it will keep me uber warm and looking cool all at the same time .. love it. Was worried about ordering this coat but read the reviews and found them helpful so went ahead and ordered a size 12. As usual promptly delivered well packaged, was delighted with it, beautiful shade of pink true to size, heavy but very warm and luxurious. The fastenings are hidden easily used. I can honestly say it is a quality garment that looks more expensive than it is. So delighted was I that I went back on line to order the coat in blue for my daughter, unfortunately they had sold out in the size required. Yes yes yes would recommend this coat. Excellent quality, really, really soft and well made. Gorgeous dusky pink colour. Quite thick and heavier than expected. Very warm. True to picture and true to size. Looks fantastic and had some nice comments. Absolutely delighted with my coat ,really good quality. This coat is unbelievably warm and looks great. It is heavy and that could be an issue for some people. Lovely coat, true to size & looks alot more expensive. Absolutely gorgeous. Good quality and good weight/thickness so really warm. Fantastic coat! the coat looks good for any occasion the fit is great I just love it. Got this coat for a weeks break to Budapest last month. I had lots of positive comments from fellow passengers and staff saying how beautiful the coat was. It kept me "toasty" warm during my break, but the only downside was the rather "fiddly" hook fasteners, hence the 4 star rating. Overall, a great looking, warm, stylish coat. Do you have to go a size smaller as described as oversized? BEST ANSWER:We would recommend buying your usual size in this coat. For reference, our model is a size 10 and wearing a size 10.